THIS IS THE PAGE TO LIST YOUR REVIEWS. IF YOU HAVE FINISHED, WRAP UP POSTS GO ON THIS PAGE. OR CLICK THE BUTTON ABOVE. 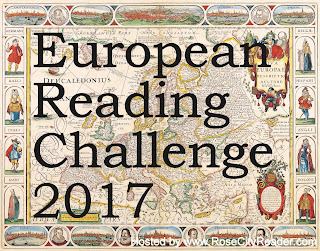 When you review a book for the 2017 European Reading Challenge, please add it to this list using the Linky widget below. Please link to your review post, NOT the main page of your blog. If you don't have a blog or other place where you post reviews, so don't have a way to link your review below, just post your review in a comment on this page. NOTE: There is overlap in January 2017 between the last month of the 2016 challenge and the first month of the 2017 challenge. If you participated both years, only count books read in January in one of the years, not both. Please put your name or the name of your blog, the name of the book you reviewed, and the country of the book or author. For example: Rose City Reader, Doctor Zhivago, Russia. First book of the challenge done! Thanks again for hosting! First of the challenge DONE! We are off to a good start! Thanks for posting your reviews. Book number two done, The Sorrows of Young Werther by Goethe. Beautifully tragic. So far, I've visited the UK and Iceland. I'm having fun finding new places to visit. Doomsday Book by Connie Willis was great! My third book of the challenge -- some vintage Nordic noir from Swedish crime writer Hakan Nesser. I meant Finland. The Rabbit Back Literature Society is Finland. Should I relink with the correct country or is there a way to edit the link? Audrey: I removed the incorrect link for The Rabbit Back Literature Society. You can add a correct link. I don't know how to edit links. Thanks! Thank you! My brain clearly went with "some northern country" and stopped at that. Link doesn't seem to be working. Linky disappeared there, but it's back. K. Olson and Phinnea -- I added your last links. Please list the name of the book and the country in your link description, along with your name or the name of your blog. Thanks! I think this is my fifth book, but am losing count: Elena Ferrante's "My Brilliant Friend," for Italy. I've lost count as well, but just finished and reviewed A Man Called Ove for Sweden. My blog is Introspective Yarns. I loved My brilliant Friend Melissa, but then got bored around the middle of the second book in the trilogy. Interesting hype around the author. Down to France and back in time with Hilary Mantel's A Place of Greater Safety. Travelled back to St. Petersburg, Russia for Crime and Punishment by Fyodor Dostoyevsky. I just posted my fifth book. This is a fun challenge. I hope to add two or three more before the year is out. Thanks for hosting this challenge! Added my 6th book, Poland, 1791-94, Third of May Constitution. 3.5 more months in the challenge - I wonder how many more I can read?! A quick stop in Belgium officially brings me halfway through the tour! And I have to admit, some of these smaller countries are making it difficult. I feel a lot of inter-library loans coming up. Currently reading Voices from Chernobyl for Belarus to finish off the "B" countries. At this point I'm not sure if I'll make it through all of Europe, but I'm already really pleased the the results. Onward explorers! Clicked "submit" before I added the location to my entry for *The Contest*. It takes place in Armenia. I had to redo the challenge entries. Those three "Tea" entries are wrong. Is there a way to delete them? Thanks. My first book is "French Woman for All Seasons" by Mireille Guiliano (France) @ StClementsDaughter. My second book is "Marry Him and Be Submissive: Radical Advice from a Real Woman About Marriage, Love, Kids, Work, Play & Everything Else" by RAI journalist Costanza Miriano (Italy) @ StClementsDaughter. My favorite book to reread during Advent: "A Yearbook of Seasons and Celebrations" by Joanna Bogle (England) @ StClementsDaughter.